The decision to outlaw octopus hunting at seven select diving spots in Puget Sound was a compromise between those who wanted a complete closure throughout Puget Sound and those who wanted no closure at all. Giant Pacific octopus at Pinnacle Rock, Hood Canal. Janna Nichols, a leader in the local scuba diving community, told me that nearly all scuba divers who spoke out wanted a complete ban on killing the giant Pacific octopus in Puget Sound. But scientific arguments were presented that the octopus population was healthy and could tolerate a limited harvest. Janna is outreach coordinator for Reef Environmental Education Foundation (REEF). She has led many dive surveys of marine species and served on the octopus advisory committee appointed by the Washington Department of Fish and Wildlife. “From what I saw in the diving community, about 99 percent were in favor of closing all of Puget Sound to harvest, and they were a little disappointed in the outcome,” she said. Janna said she knows divers who go spear-fishing but has only heard of divers who harvest octopuses. 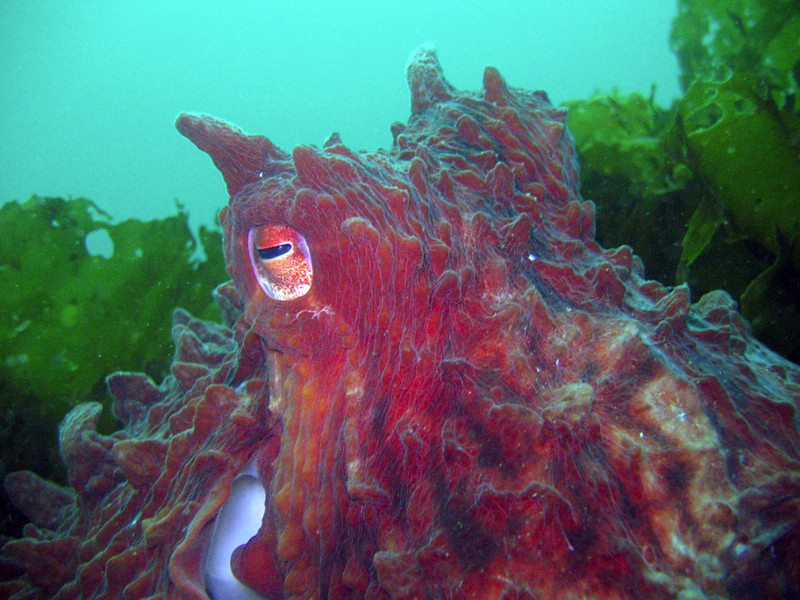 The new restrictions were proposed after a diver legally killed a giant Pacific octopus at Seacrest Cove 2 in West Seattle. The incident was widely publicized, and many people expressed outrage, saying they had no idea it was legal to hunt the gentle and intelligent octopus. More than 400 comments were received on the proposal to restrict the hunting of Octopuses in Puget Sound. After working with the advisory committee, WDFW proposed a variety of options for greater or lesser protection of the octopus. In August, the Fish and Wildlife Commission approved a closure at the seven dive sites. Conspicuously missing from the list are any locations in Hood Canal, which has several popular dive sites for spotting octopus. Hood Canal was bypassed for increased protection, because the entire waterway is currently closed to fishing for nearly all species except salmon. That’s because of the extreme stress that most deep-water species are experiencing as a result of low-oxygen conditions. If conditions ever improve to the point that marine fish are allowed to be harvested, I would expect that the Fish and Wildlife Commission will examine which species need ongoing protection — and the octopus issue could come up again. Sund Rock and Octopus Hole, both south of Lilliwaup, are two popular dive spots to view octopus. Both are designated as marine conservation areas and will continue to protect all species from fishing. “Protecting our native animals enriches our experience of life in the Sound. Scientists, sport fishers, divers and the public at large, we all have an interest in a rich marine world. It became clear to me through this process of creating octopus-protection areas that many observers would like to see more marine protected areas for all species. Everyone agrees that such areas can be a benefit if the areas are selected carefully after adequate study and planning. The problem, as in many conservation issues, is a lack of money to perform the necessary background work. Glasgow said he is frustrated by the lack of action in assessing and coordinating existing MPAs and setting up new ones. The issue has not received the attention it deserves from the Puget Sound Partnership or WDFW, he said. Both include stories about octopuses. But what I love about both of these is the human interaction. They also take me back about 35 years to a time when I was actively scuba diving all over Puget Sound. I really love this picture by Araminta “Minty” Little, a seventh grader at Fairview Junior High School in Central Kitsap. Her picture shows an octopus grasping trash that has been thrown into the ocean. 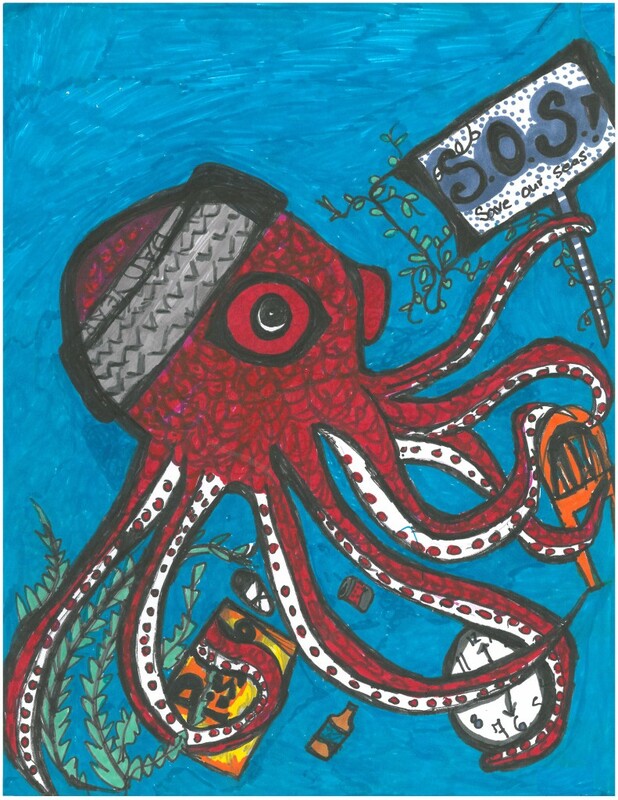 Apparently, the judges in the annual Marine Debris Art Contest also liked Minty’s picture. They named her one of 13 winners nationwide out of more than 600 students from 21 states who entered the contest, which is sponsored by the National Oceanic and Atmospheric Administration. To see all the 2012-13 winners, check out the slide show on the Marine Debris Blog. The contest is open to students from kindergarten through eighth grade. The 13 winning entries will be used to create a calendar scheduled to be printed in a few months. 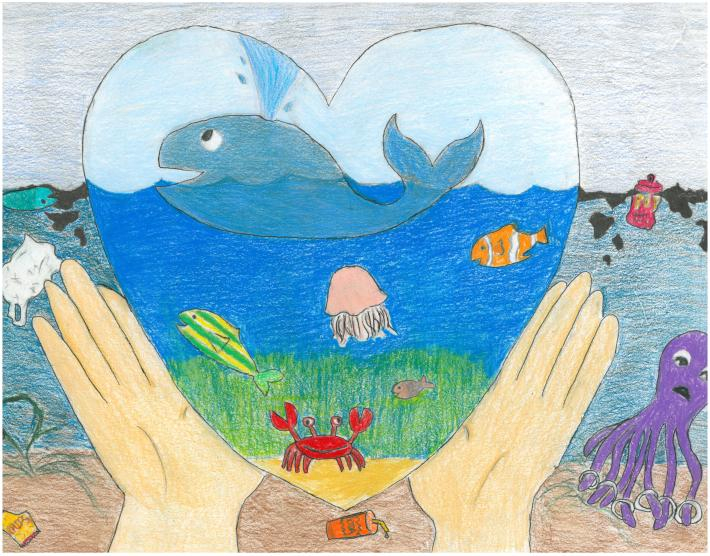 “You wouldn’t believe the talent of some of these students,” said Dianna Parker of NOAA’s Marine Debris Program, which has conducted the art contest since 2010. The next contest opens to entries in September. 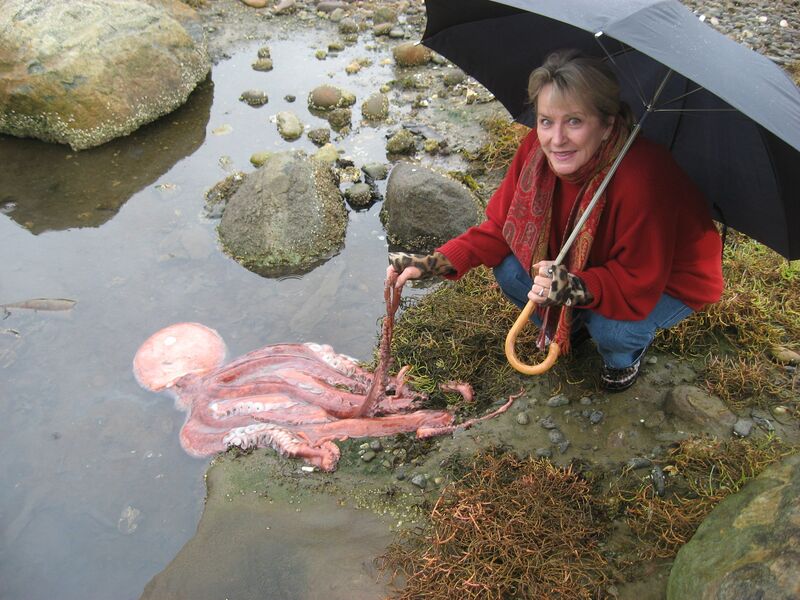 A giant Pacific octopus with 4- to 5-foot tentacles washed up dead this week at Elandan Gardens in Gorst. Diane Robinson, who owns the gardens with her husband Dan, called to tell us about it, and I went by and took a few photos. Marine biologist Jeff Adams of Washington Sea Grant, who writes a blog for the Kitsap Sun, says there are probably plenty of places for the creatures to live in Sinclair Inlet, including rocky shores and sunken boats. 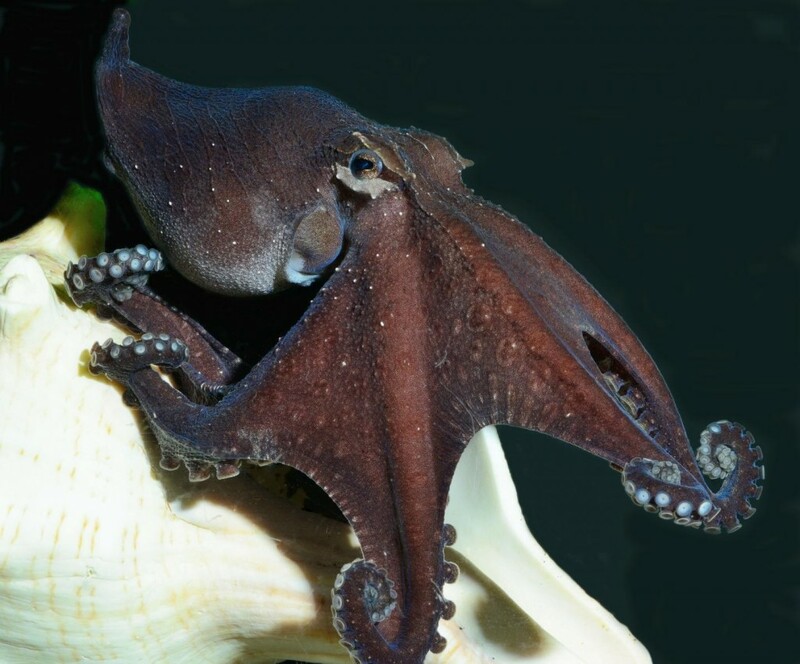 Jeff wrote about octopuses in his blog Sea Life in February of 2010. The record size of a giant Pacific octopus is about 30 feet (9.1 meters) from tip to tip with a weight of more than 600 pounds (272 kilograms). They live to about 4 years old, and both males and females die soon after breeding. Females usually live long enough to take care of their eggs and watch them hatch. They hunt at night. living mostly on shrimp, crab and fish. Their suckers can taste and capture their prey, which is brought to a sharp beak, the only hard part on its body. They are highly intelligent with a brain that encircles the throat and extends down to each tentacle. In laboratory tests, they have been been able to distinguish shapes and patterns, solve mazes and twist off jar lids. During sleep, they demonstrate brainwave patterns that suggest dreaming. One of my Amusing Monday pieces focused on a video of a battle between an octopus and a shark. I later learned that the video was taken at the Seattle Aquarium, and I told the story behind the video. Note: I’m on vacation for the next 10 days, so I’m repeating an “Amusing Monday” entry from Aug. 4, 2008, which features a “National Geographic” video dramatizing a battle between a shark and an octopus. When I first ran this item, I did not know for sure where this action took place. I later got the full story of the shark-versus-octopus battle from staff at the Seattle Aquarium. See “Amusing Monday” for Aug. 12, 2008. As for my vacation, I’m sticking around home, so I may post a few blog entries if I get a chance. This might not be the kind of story that triggers the normal kind of laughter. In fact, now that I think about it, this video ought to come with a warning. “Caution: This video contains violence of the animal kind.” OK, it’s really not that bad. I’ve been trying to figure out where this event took place. The animals involved are Northwest natives, but the video does not say which aquarium was involved. I’ve put in an inquiry to National Geographic, but they have not checked back yet. An Internet search reveals several comments linking this event to the Seattle Aquarium, but none of them are official sites. At least one site mentions a connection with the Oregon Coast Aquarium. If anybody knows more, please let me know. I found this film in the Prelinger Archives, a large collection of old films and television commercials started in 1983 by Rick Prelinger in New York City. It’s a longer video than I usually offer for Amusing Monday. But if you pick any point on either of the two video segments you will find something interesting, if not shocking. If you are limited on time, check out Part 2 at 2 minutes, 50 seconds, where the fear of a large octopus is truly amusing, knowing what we know about these creatures in Puget Sound. The storyline of “man against nature” seems quaint from a modern scientific perspective, but I wonder how many people still hold this world view. In recognition of Octopus Week at the Seattle Aquarium, I’m putting up a few videos for your entertainment and education. I’m posting this “Amusing Monday” early, so you can review the list of events at the Seattle Aquarium beginning this weekend. First, before getting to the serious stuff, I’d like to start with an animated short film, “Oktapodi.” The film started out as a graduate school project by a team of French animators from Gobelins L’Ecole de L’Image. The production was nominated for an Academy Award during last year’s presentation and won numerous honors at film festivals. The YouTube version here is OK, but if you want to see the film in full quality and can wait for the video to download, visit the official Oktapodi Web site and view the QuickTime version. Back to the real world, check out this BBC video showing a diver up close with a giant Pacific octopus. Elsewhere, the so-called mimic octopus is a fascinating creature, as shown in this video shot in Indonesia. Finally, completing the tour, here’s a video from the Seattle Aquarium Web, which includes this sea creature as well as others. Last week’s “Amusing Monday” entry was indeed shot at the Seattle Aquarium — and there’s more to the story than meets the eye. The announcer in the video doesn’t say where the scene was shot, so I put out a request for information. Thanks go to Susan Berta of Orca Network for putting me in touch with folks at Seattle Aquarium, which ultimately led to an interview with biologist and lead diver Jeff Christiansen, who was involved in shooting the video. Before 1987, the dome exhibit often included three octopuses — the number required to almost guarantee that people would see one, Christiansen told me. The octopuses would hang out in a recessed area under the lower windows inside the tank, he said. That was before the rocky reefs were installed. Also in the tank were a number of dogfish sharks, another native of the Puget Sound region. But not all the dogfish survived. 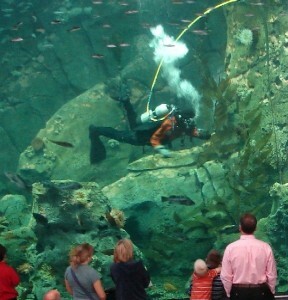 Frequently, aquarium workers would arrive in the morning to see the remains right in front of the viewing windows. The middle of the dogfish carcasses were completely eaten down to the bones, but the head and tail were intact. “It was considered bad to have dead animals sitting down there in the tank when you opened up (the exhibit) in the morning,” Christiansen said. Divers, who normally went into the tanks in the afternoon, had to put on their gear and make a special trip into the tank, he said. Today, divers are in the tank several times a day. Although the sharks were easy to replace, especially in those days, aquarium managers were worried about losing rare and valuable fish, he said. In fact, once an octopus was able to eat a sizable salmon before the decision was made to take the octopus out. Anyway, about 10 years ago, Mike DuGruy of National Geographic Films was doing a feature on octopuses when he heard the story about the shark-eating creatures. The details of the recreation are somewhat proprietary, Christiansen said. But that’s how the dramatic battle of the shark and the octopus came to be a National Geographic story. Today, with the recent remodel of the aquarium, octopuses have their own space. With divers in the tanks several times a day, they could feed the octopuses enough so the animals wouldn’t go after fish, Christiansen said. Still no decisions have been made to put octopuses back in the big tank.